Share your Office 2016 files with others so that they can view or edit your work. Sharing is a way to collaborate with others on Office files. Starting in the OneDrive window, you can share a folder (that is, all the files in the folder) or an individual file. Follow these steps to share a file (or all the files in a folder) by sending out an email message with links to the files (see the following figure). All the recipient of your email message has to do to read or view the file is click a link. In OneDrive, select the file or folder you want to share. You can find the Share button on the OneDrive toolbar along the top of the screen. As shown, you see the Share window. If you’re sharing the file or folder already, the sharers’ names appear on the left side of the window. Enter the email addresses of the people with whom you will share the file or folder. Enter a message as well, if you want. If you want the recipients of your email invitation to be able to view the files without subscribing to Office 365, click the Share button now; otherwise, keep reading. Click the Recipients Can Edit link. As shown, drop-down menus appear. Choose access privileges on the drop-down menus. On the first menu, choose whether recipients can view the file(s) or view and edit the file(s). On the second menu, choose whether recipients need an Office 365 subscription to view or view and edits the file(s). The Share window opens. It tells you who shares the file or folder with you. You can return to this window at any time to unshare files or folders as well as change how files and folders are shared. Follow these instructions to share a file (or all the files in a folder) by generating a hyperlink. 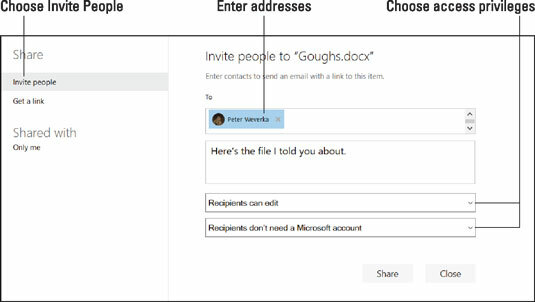 After OneDrive generates the link, you can post it or send it to others. Anyone who clicks the link can view (or view and edit) the file. In the OneDrive window, select the file or folder you want to share. As shown here, you see the Share window for generating a link to your file or folder. 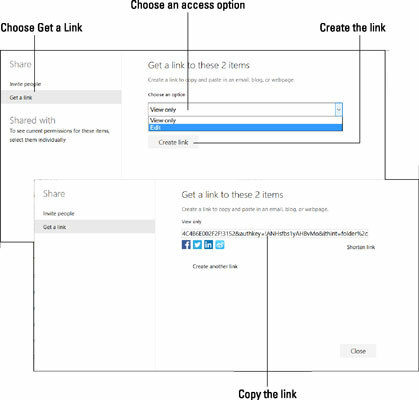 File sharing by generating a link. Choose an access option on the drop-down menu. View Only: Others can view the file (or all files in the folder if a folder is being shared), but not edit the file(s). Edit: Others can view and edit the file (or all files in the folder if a folder is being shared). OneDrive generates the link. You can click Shorten Link to generate a shorter and more manageable version of the link. Select the link (double-click it). Right-click the link and choose Copy. You can now paste the link where you will — to a blog, web page, or email message.